2. Pollard Station looking towards railroad crossing. 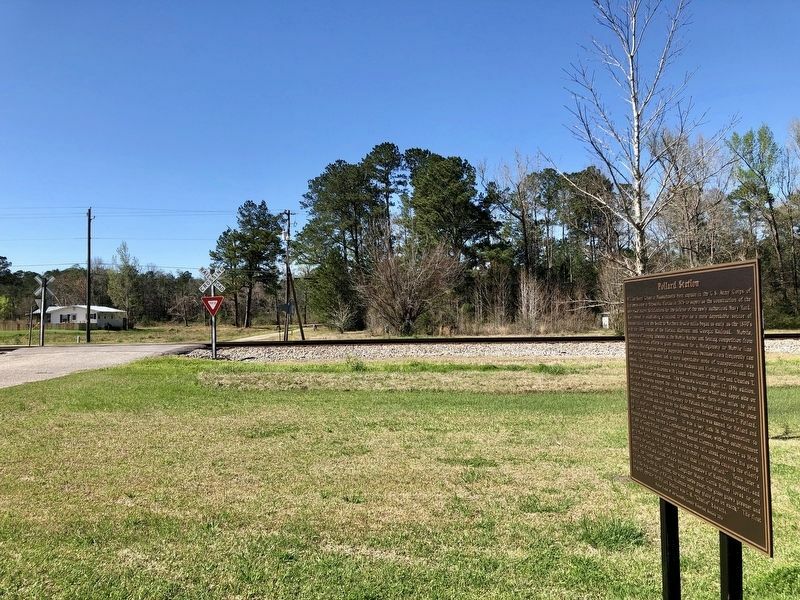 the Escambia River forty-five miles to join Alabama rails being laid from Montgomery to Pollard Station just north of the state boundary." Planned and laid out by the Alabama lines President, Charles T. Pollard, and his chief civil engineer, Samuel G. Jones, the town was named for Pollard and lay 114 miles south of Montgomery. 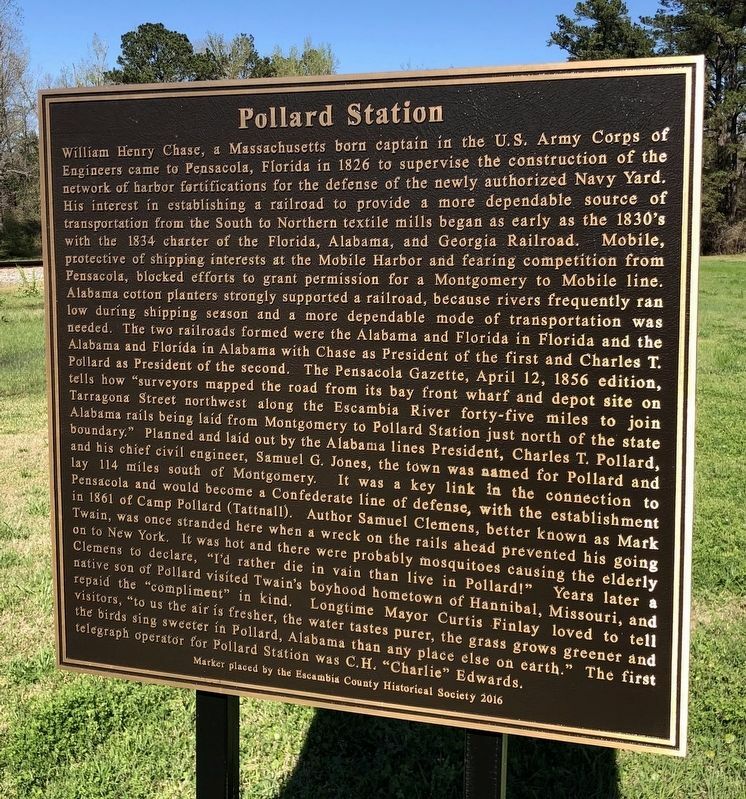 It was a key link in the connection to Pensacola and would become a Confederate line of defense, with the establishment in 1861 of Camp Pollard (Tattnall). Author Samuel Clemens, better known as Mark Twain, was once stranded here when a wreck on the rails ahead prevented his going on to New York. It was hot and there were probably mosquitoes causing the elderly Clemens to declare, "I'd rather die in vain than live in Pollard!" Years later a native son of Pollard visited Twain's boyhood hometown of Hannibal, Missouri, and repaid the "compliment" in kind. 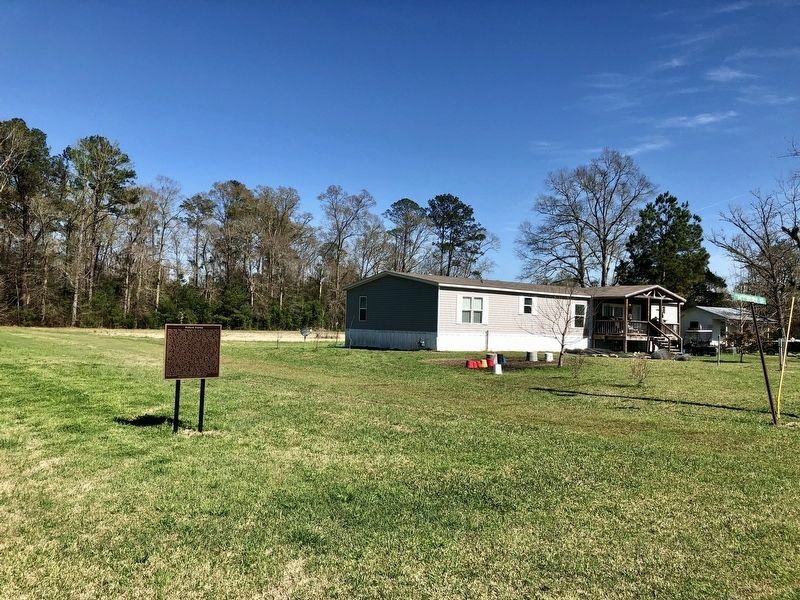 Longtime Mayor Curtis Finlay loved to tell visitors, "to us the air is fresher, the water tastes purer, the grass grows greener and the birds sing sweeter in Pollard, Alabama than any place else on earth." The first telegraph operator for Pollard Station was C. H. "Charlie" Edwards. Erected 2016 by the Escambia County Historical Society. is in Pollard, Alabama, in Escambia County. Marker is at the intersection of Canterbury Street and Richmond Avenue, on the right when traveling north on Canterbury Street. Touch for map. Marker is at or near this postal address: Canterbury Street, Flomaton AL 36441, United States of America. Touch for directions. Other nearby markers. At least 8 other markers are within 7 miles of this marker, measured as the crow flies. Francis B. Bonifay Law Office (about 500 feet away, measured in a direct line); The Lindsey-Fitzgerald House (about 800 feet away); Pollard Methodist Church (approx. 0.2 miles away); Site of Pollard (approx. 1.3 miles away); Southern Pine Electric Membership Corporation (approx. 5.1 miles away); Alabama's Own (approx. 5.6 miles away); Flomaton, Alabama (approx. 5.7 miles away); Alger-Sullivan Lumber Company Residential Historic District (approx. 6½ miles away in Florida). Touch for a list and map of all markers in Pollard. More. Search the internet for Pollard Station. Credits. This page was last revised on March 7, 2019. This page originally submitted on March 7, 2019, by Mark Hilton of Montgomery, Alabama. This page has been viewed 105 times since then. Photos: 1, 2, 3. submitted on March 7, 2019, by Mark Hilton of Montgomery, Alabama.